It is time for another post in a series showing cards of five players with only one card in my collection. I'm using sorting tools at The Trading Card Database to look through my collection on their site to see who only has one card, and then finding the first five names that I haven't posted yet. I'm also using the images from their site. You might think that I set up this Topps Total card to be here after Topps made their announcement of how they are going to handle their new Topps Total baseball set, but I didn't. I started this post by selecting the cards over a week ago, but just haven't sat down to work on it. As for the new Topps Total announcement, I am very disappointed. I don't want an on demand set, I want it in boxes in the stores. I want all the players, the 900 card set is nice, but I have no interest in the cards at that price point. With perfect distribution, and not getting any parallel cards, one would need to spend $900 to collect the set. And what are the odds of perfect distribution? Anyway, on to this card. 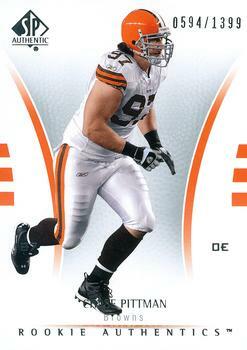 It represents my Cleveland Browns collection of punter Derrick Frost. Outside of the printing plates for this card, there are 1st Day and Silver parallels to find. 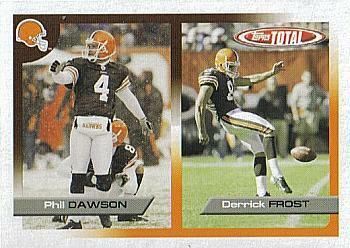 Frost punted for the Browns for the 2004 season. It is interesting to read the "ROLE" blurb on the back of his card. As it turned out he was beaten out for the job by Kyle Richardson. He was signed by the Redskins later in the 2005 season, and played three seasons with them before playing in his final NFL season in 2008 with the Packers. 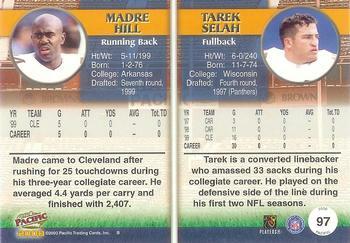 As for sharing this card with Phil Dawson, Frost was Dawson's holder on special teams. You can see him in Dawson's photo. When I came across Chase Pittman's name on the list of players with only one card in my collection, I had to doublecheck whether I had shown his card before. As it turns out, it was a Chris Pittman that I wrote about before. 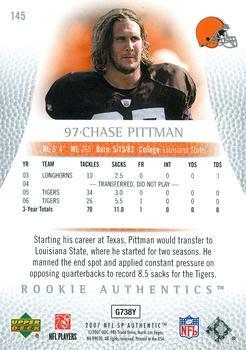 Chase Pittman was drafted by the Browns in the 7th Round of the 2007 NFL Draft. An online article on nfl.com from September 1, 2007 says that he was cut by the team. There is a gold parallel, numbered out of 25, of this card to collect. 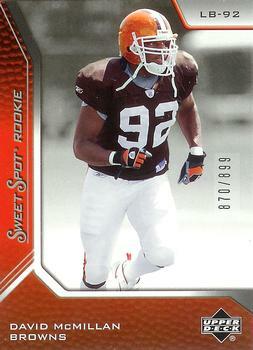 Alex Hall is another 7th Round draft pick of the Browns, but from the 2008 NFL Draft. He played two seasons with the Browns before being included as part of the trade to the Eagles for Sheldon Brown and Chris Gocong. Alex Hall went on to play in the CFL, where he made an All-Star team with the Winnipeg Blue Bombers, and was part of the 2013 Grey Cup winning Saskatchewan Roughriders. 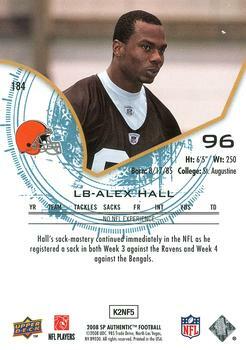 This appears to be his only Browns card. 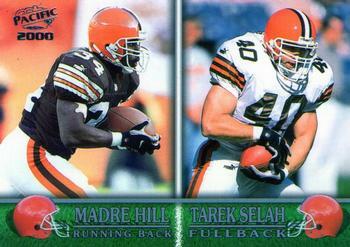 This card represents the one card in my collection of Tarek Saleh who played for the Browns from 1999-2001. He only has Browns cards in this Pacific set, but there are three numbered parallels for me to collect to join this card. 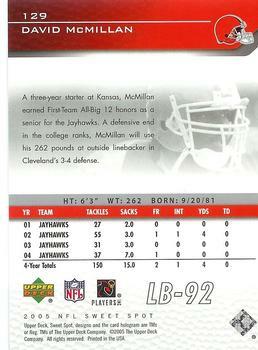 David McMillan was drafted by the Browns in the 5th Round of the 2005 NFL Draft. 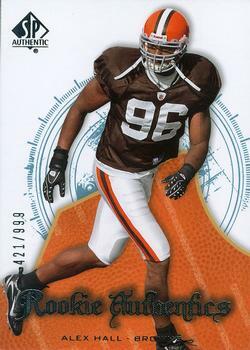 He went on to play for the Browns during the 2005-2007 seasons. Sadly, he died at the age of 31 in May 2013 after he was shot during an apparent robbery attempt in Georgia. This appears to be his only NFL card. 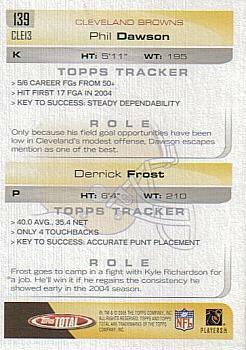 The image on that Derrick Frost card has a very Pro Set feel to it! I love seeing cards featuring kickers and punters. That's why old school Topps Total rules! I love these posts, great to see a member of the Riders Grey Cup team.